« Make your own Rubber Stamps! During my trip to Hokkaido in December, I came across a craft little shop (more like a craft section) within the Aeon Mall at Wing Bay Otaru. Hanging from the ceiling were bags, and below, fabrics and notions that you can buy to make the very same bag! I fell in love with this one immediately. 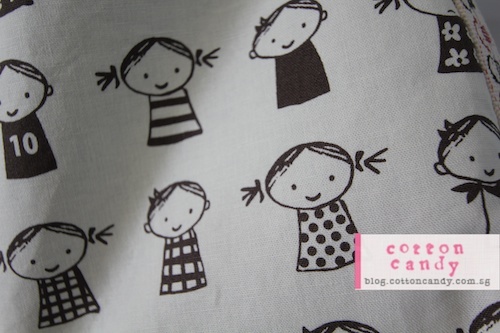 The fabric is sooooo cute!!!! There were two other colors, but I chose the original brown. Part of the fabric range includes the co-ordinating stripes for the base and side pockets. 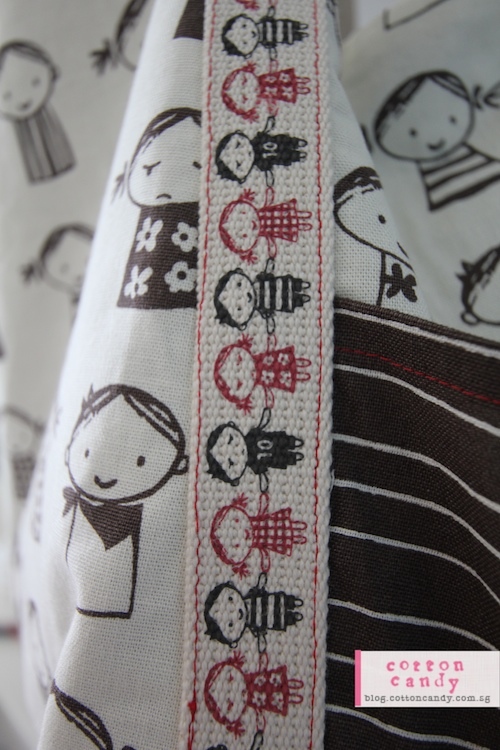 The strap is also printed with the cute characters. My kids were really observant, they noticed that the characters on the strap had arms and legs whilst the ones on the fabric didn’t! 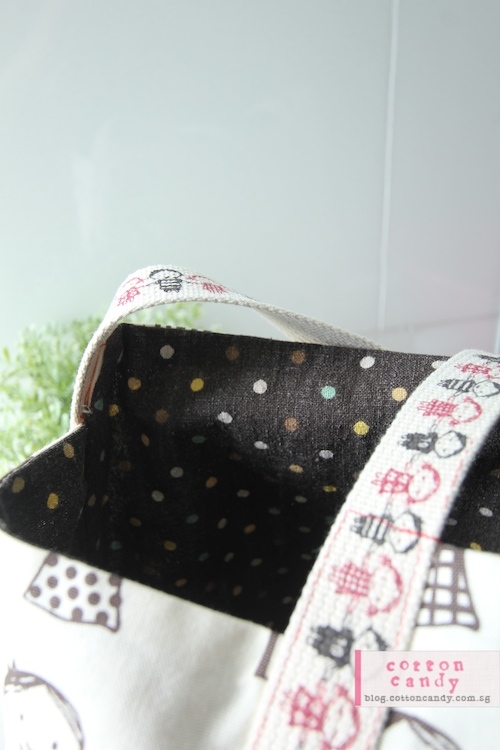 For the lining, I chose a brown linen with multi color polka dots which I bought from Japan too, but from another fabric shop. My DH thought it was such a waste of a lovely fabric, but to me, the lining is a huge part of the bag. It really completes the bag, using anything less co-ordinated would have been a waste of the exterior fabric. I only bought enough of the striped fabric for the side pockets and base, which was why I couldn’t use the same striped fabric for the interior. Some shops sell the patterns of the sample bags but usually those patterns are actual sized pattern paper which is why they will charge you for it. As this pattern was made up of simple geometric shapes, a diagram showing how the shape was derived was drawn on the A4 size paper so you will still have to draw it out yourself on a larger piece of paper to make the patterns. But it’s pretty easy. 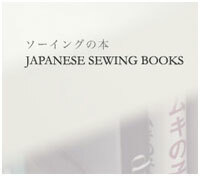 Fabric line is from Puti de pome, made in Japan. You can have a drool at the fabrics here! 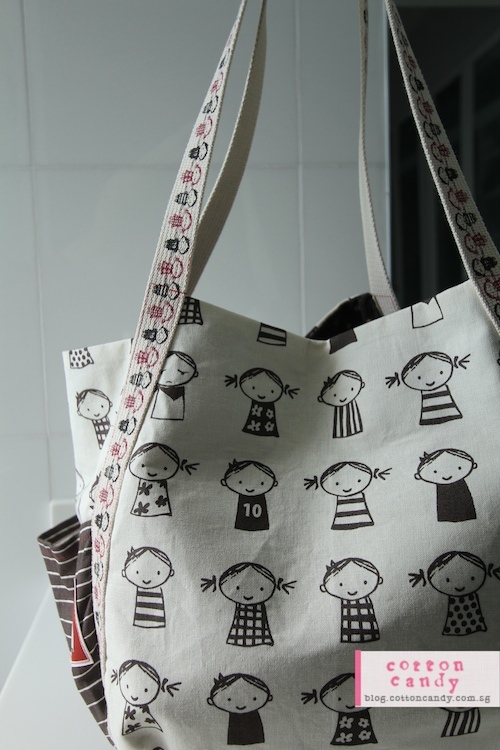 Oh, and by the way, the bag looks kiddy and my blog is all about kids but This bag is for ME! Posted on January 26, 2012 by Cotton Candy. This entry was posted in Bags, Fabrics, Hand made and tagged bag, japanese fabric, puti de pome. Bookmark the permalink. I just love that bag with the little children. Is there anyway to buy that pattern or can you direct me to the website where that pattern is sold. The pattern was provided free at the store where I bought the fabric. But it’s entirely in Japanese. The dimensions are provided for the pattern pieces and steps are in diagrams. I’ll have to see if I can find it and email it to you? I would really appreciate it. That’s okay if it’s in Japanese, I have a daughter-in-law that can help me with the translations. here’s my email incase you find the pattern.